At first Everett is disappointed when a girl moves in next door. Soon enough, he learns what a great friend Maria can be to him. 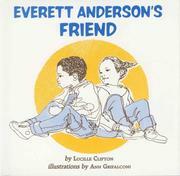 Clifton, Lucille, “Everett anderson's friend,” Children's Picture Book Database at Miami University, accessed April 24, 2019, https://dlp.lib.miamioh.edu/picturebook/items/show/6044.